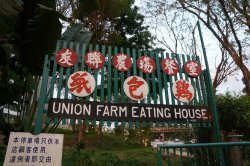 This restaurant is located near SIM University and Ngee Ann Polytechnic so if you are to take public bus, stop at the bus stop next to Ngee Ann Polytechnic before walking over to the restaurant. Free parking if you are using private car. You will be able to see the signboard of the restaurant at the entrance so it is actually not hard to find it if you open your eyes. Please be early if you want to eat their famous “Paper Wrapped Chicken” as if you are reaching in the evening, you might not be able to eat it as it is normally sold out by then. 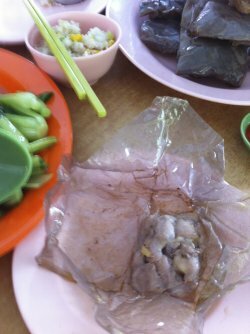 This is the famous Paper Wrapped Chicken which up till now (I have eaten quite a few places with paper wrapped chicken dish) no restaurant in Singapore can compare with this restaurant. 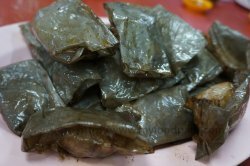 Even though the outside looks very oily, the inside is not oily at all, to be more specific, inside is more on the original taste and juicy of their special ingredients. 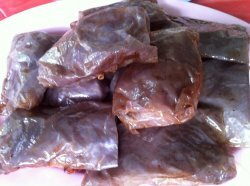 Taste wise, it is very tender and juicy and if one person just saw it meat, nobody will know it have been deep fried before. 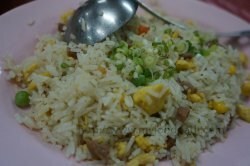 Overnight rice are being fried together with some vegetables, eggs, and luncheon meat with some other ingredients which makes the rice very puffy and nice. Great to be taken together with the side dishes. 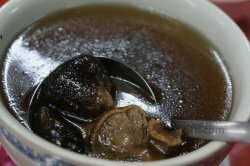 A few types of mushroom are being boiled together with some chicken legs and some herbal which enhance the overall taste of the soup. For one person who do not really drink soup, this is one soup that I do not mind drinking a second helping. Taste wise, ofcourse there is mushroom taste but you can also taste that little bit of nice chicken soup base. 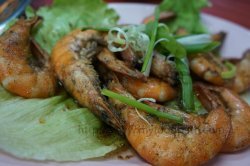 The prawns are very fresh and they are mixed with some sea salt while cooking it so actually, it does not really looked like butter prawns which should be more oily type. 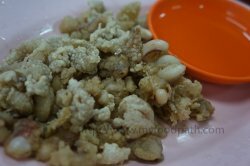 A nice and interesting dish which I am not able to find it in other places. There is a bee hoon version of this too. 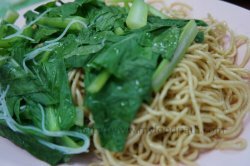 Noodles are fried with oyster sauce and topped with some vegetables but still have that QQ chewing feeling. 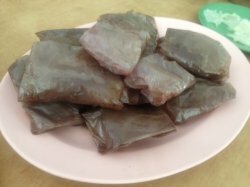 This is best eaten with the juice from the paper wrapped chicken which makes the overall taste of the noodles to be better. This eating place now only allow take-aways as they're going through some renovation work/still in some sort of legal problem over land ownership. I went with my mom and sister once and the food was indeed disappointing. Oil for them was like free-flow and the i can only imagine the cook to be an amateur, or one who burnt his taste buds away while learning how to cook. The chicken had more bones than meat and it was like lucky draw trying to get those pieces with full meat in it. I could only taste a wee bit of flavour from the chicken and was turned off by the oil that was dripping away like a spoilt tap. The vegetable was.. edible. Although, again, drenched in oil. You can see the puddle of oil where we tipped the plate to let the oil flown down. Otherwise, it'll be like drinking oil again. I hope they do something about the food and not tarnish the name further; really miss the taste of good zi bao ji. I was told it is not worth trying the paper wrapped chicken in here as there is a significant drop in their standard as compared to decade ago. I was told their dishes including the special paper wrapped chicken are over priced. I still decided to try it. We ordered for 2 paxs. We tried the famous paper wrapped chicken but not impressed. It tasted quite bland and a tad oily. 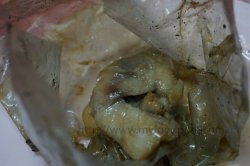 The chicken pieces wrapped in the paper have got very little meat but a lot of bone. I do not think i am coming back again. This paper chicken is really nice! The taste and the texture of the chicken is just nice and is cooked to perfection! It is not salty nor fatty but it is a little too oily for my taste buds However, removing the paper out from the chicken is a little tedious and it may be a little too pricey for a student like me Still good chicken and a unique way of cooking chicken! Still good chicken and a unique way of cooking chicken! We came bc'os my father-in-law liked this place in the past. The visit will be my first and last .... for now. (4) Was not expecting much for so-called dessert by the end of the dinner but stayed on since it was part of the set & we were not filled yet. Then came a plate of orange with agar-agar. Personally, I will not visit or recommend this restaurant again (hope the restaurant does not relocate itself to a new setup). I am wondering what was special about this restaurant before since their current service & food is well below those in Malaysia & Batam but priced like a 4-star restaurant (there were even reviews from current celebrity & a former President dine there before). Has the previous owners sold the place to a "new" management? Well, perhaps that visit was the first and last time we would go. Why? 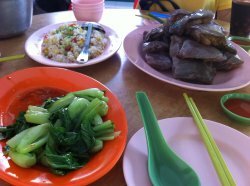 From their menu, everything seemed fine, with some drooling name of their paper wrap chicken, sotong and prawn. We were in a group of 8 people, and chose a set dinner for 8 people that come with 8 dishes. Sound good. yup, until we saw what was served. (1) The fried rice- cold and tasteless - I can fry better than them. Imagine we were group of 8 and the rice serving was like only for 2 ppl? And they don't have white rice. End up we need order another fried mee which turned up looked like maggie mee plus bit of oil =="
(2) The prawn, vege and toufu- prawn was really normal, toufu was like normal fried toufu. (3) The so-called dessert- was just a plate of orange (simply cut). (4) Well, their so called famous paper wrap chicken - is really normal. What makes this dining experience even worse was it was after raining, the dining place was like 'atap house'.. the traditional wooden house and open air. There were lot of flying bugs flying around and eventually in middle of eating, the bugs flew in our dishes. At the end, we ended up have plates of bugs instead of the proper food. What's more, it was really expensive, the course like this, seriously only enough for 4 ppl eating costed us near to $120. 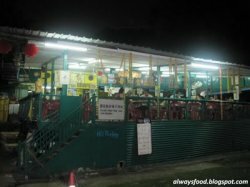 Eventually, they refunded us $20 as we complaint the food was fulled with bugs. Well, to me, I will never visit this restaurant again. I don't know what makes it so special when their service, food and price were totally sub standard.